What is Drop Shipping, and How Can I Profit From It? Drop Shipping is an interesting concept, one that entrepreneurs have been using for years. The idea is pretty straight forward. A drop shipper puts up a listing for an item for sale, whether it be through Craigslist, eBay, or whatever preferred method of sale they prefer (we will use eBay for our discussion further below). The listing itself is advertising an item that the drop shipper doesn’t actually own, but rather is an item that they know they can buy cheaply. A buyer comes along and buys the item, unaware that the seller/drop shipper doesn’t have it in their possession. The drop shipper then takes the money from the sale, purchases the item at a cheaper price than what they sold it for (typically from a wholesaler) and keeps the difference as profit. At first glance, this seems like a dream scenario for many entrepreneurs looking to make easy profit; after all, the drop shipper has no overhead. They don’t have to store their products in a warehouse or worry about shipping or handling. They simply have the wholesaler ship the item right to the customer, pocket their “middle man fee” and never have to see the product in person. Drop shipping can be a very cool position to be in within the sales and marketing industry, but like anything it has its own ups and downs. Now that you have a good sense of what drop shipping is in general, let’s talk about some tips to follow and pitfalls to avoid when doing it through one of the most popular drop shipping mediums: eBay. eBay is the number one choice for most drop shippers for many reasons, but most of all its ease of use and traffic. eBay has a well understood platform that is easy to get started with, and most of the public already knows it as a platform for buying and selling – this makes it an ideal marketplace to offer goods as drop shipping middlemen. Available stock is one of the most important roadblocks to lookout for as a drop shipper. The profit margin (the difference in dollars between what a drop shipper buys and sells the product for) is often quite thin for any given transaction, which means that most successful drop shippers make their living by drop shipping in large quantities. Thanks to the power of the internet and sites like eBay, there are hundreds of thousands of willing buyers browsing each day, so sale volume is often not an issue for in-demand products. A big issue arises, however, when a drop shipper offers more products than he/she can fulfill. Because the drop shipper isn’t actually the supplier of the product, they typically have no direct control over its availability. If a drop shipper gets overly eager, they can fall into the trap of selling more than they can buy at any one time. This is especially troublesome with eBay, since the site gives no allowance for orders cancelled due to unavailability. If the item is listed on eBay, it is assumed to be physically available, and buyers will expect to receive it. Not complying with a buy order can lead drop shippers to receive a ‘seller nonperformance’ violation from eBay – too many of these and your seller account can be banned for good. The key here is planning. The last thing you want as a drop shipper is to work so hard to have a well-poised business selling account on eBay, only to have all that work closed down in an instance because you sold more stock than you could get. Make sure you only offer as much product as you know for sure you can get from the supplier in a short-term time, and cap yourself at posting that amount. Stick to this rule 100% of the time and you will be just fine. Also important is fulfillment time, which is the amount of time it takes for the order to actually reach the end buyer. The shipping and handling times of products are out of the drop shippers hands, but seeing consistently negative feedback from buyers on eBay about wait times from a specific supplier can be a good indication that it may be time to switch products. You won’t get banned from eBay for bad feedback on wait times, but a ton of harsh reviews can have a similarly negative impact on the success of your drop shipping business over time. This advice goes for customer feedback in general as well – any consistent issues your buyers are having (and leaving reviews about) will hurt your business if left unchecked, so be sure to mediate any recurring issues as fast as possible. Lastly, drop shippers need to be wary of the auction features of eBay. If a drop shipper buys and sells their products and fixed prices, there is no worry about the profit margin they will make in a normal transaction. But with auctions prices can swing, and the profit might be squeezed extremely thin if a product sells for less than expected. Some drop shippers can hurt themselves by allowing a product to be auctioned at a price point less than their own purchase price, expecting the price to go up with auction bids. This sometimes doesn’t happen as planned, causing the drop shipper to actually lose money on the transaction, which is less than ideal. Make sure you know your breakeven point if you allow your products to be auctioned, or simply set everything at a fixed price and don’t sweat. 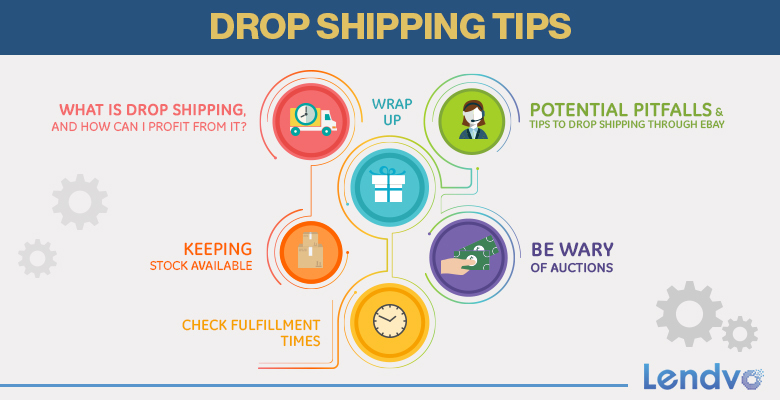 Overall, drop shipping can be a fantastic and interesting way to earn money while benefiting both your buyers and yourself. By planning correctly and doing your best to avoid all possible pitfalls, you can go on to build a successful drop shipping business.